In a perfect world, I would have features ready to go on a star player on the teams facing UConn each week. Reality, however, dictates a different strategy especially with WNBA, UConn women's basketball, high school and other college assignments on my schedule. 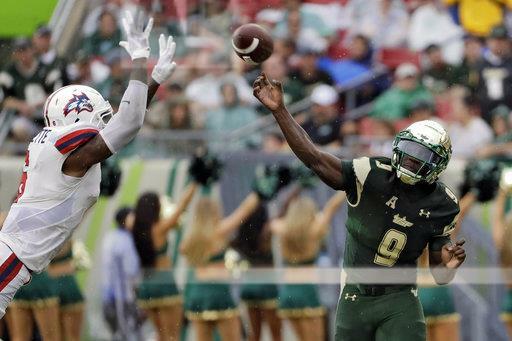 However, with the Huskies' first two conference games against South Florida and SMU, I headed to American Athletic Conference football media with the intention of catching up with dynamic SMU receiver Courtland Sutton and scintillating USF quarterback Quinton Flowers. My story on Sutton ran back in July as the top item in a notebook off media day. Now it is time for the piece on Flowers to run with USF set to face UConn on Saturday at 10:30 a.m. There are obvious reasons to write a story on Flowers, he ranks in the top 10 among active FBS quarterbacks in passing efficiency and total offense. No current quarterback at any level has more rushing yards than Flowers' total of 2,731. However, there's a more personal reason why I felt compelled to tell his story. Flowers' father died when he was seven, his mother when he was 17. That hit close to home for me because I lost both of my parents at age eight so perhaps my line of questioning on the subject matter is a little different from a person who hasn't had to attend the funerals of their parents before they graduated from high school. One quote in particular really resonated with me. "It is really emotional," Flowers said. "I lost my dad at the age of 7, I lost my mom at the age of 17. Growing up without your parents in your life is really tough. There are times when you want to go and talk to your mom or talk to your dad about some stuff and I can't do that because I know they aren't in my life but I know they are looking over me." I have to admit that when I sat down next to Flowers in Newport, R.I. in July, I wasn't even sure if he would address the subject matter with somebody he was seeing for the first time. Thankfully he brought up some of the tragedies in his life before I posed the first question about it which made it significantly less awkward for me to delve into areas that certainly must be difficult for him to talk about. I still remember being at the 2001 Women's Final Four when Purdue star Katie Douglas was asked to address the recent death of both her parents. The question was almost flippant in the way it was asked and she was certainly caught off guard. Just imagine being in front of a room of mostly strangers and basically being asked, "tell me about the deaths of your mother and father" in a similar tone that she might have been asked about trying to slow down a star-studded Notre Dame lineup in the national championship game. Douglas, who would eventually play much of her professional career in Connecticut, is about as quotable of an athlete as you will find but there are ways to ask these types of questions and doing it alongside of 40-50 other media members wasn't the way to go. Making matter worse, a few minutes after the press conference ended a couple of reporters were trashing Douglas for not expounding on a very personal matter. I won't repeat what I said to those reporters but let's just I'm still waiting to be placed on their Christmas card mailing list. I sat down with Douglas when she was with the Connecticut Sun for an interview that was similar in tone and in results to the one I had with Flowers in Newport. Words can't express how impressed I am with the two of them of being able to field questions from somebody like me. I'm not sure I could have handled being on the receiving end of these types of questions when I was a college student or early on in my professional career. Hopefully you'll enjoy reading about Flowers, who is much more than just one of the nation's most electrifying quarterbacks.